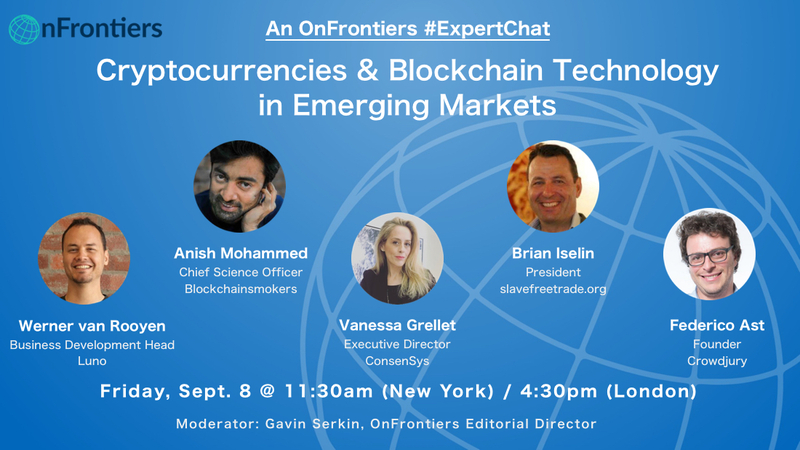 Whether you know exactly what ICO means or how blockchain works, or still struggle with the differences between Bitcoin and Ethereum (or fall somewhere in between), you’re invited to attend our next live #ExpertChat on Friday, Sept 8th. According to the Economist, the market value for crypto-currencies has tripled since the start of this year reaching $60 billion as of May. The sector is constantly evolving, so we’re covering a lot of bases in this event. Emerging markets are particular ripe for development with this disruptive technology, as reported by our own Gavin Serkin (Five Countries Where Cryptocurrencies Are Seriously Taking Hold).